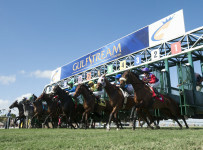 Gulfstream Park has an 11-race card today with first post at 12:35 p.m. Conditions are fast for the dirt and firm for the turf. Six races are on the turf course that has been very fast since last weekend, and has been unusually favoring to speed horses. Gulfstream has gone 21 straight race days, since Feb, 7, without a race being taken off turf. There is a $2,738,481 carryover on the Rainbow 6. It is on races six to eleven, beginning at 3:05 p.m. 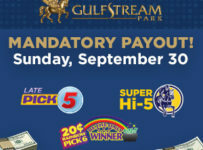 The carryover has grown because there been 40 straight race dates without the jackpot-hitting requirement of there being just one ticket with all six winners.